The purpose of our project, Speech-Tacular, is to develop a reliable funding resource to help Center clients who have limited ability to pay for Center services because of a lack of funds and/or no insurance. A second purpose for Project Speech-Tacular is to enable the Center to increase the innovative speech, language, and hearing programs it offers. 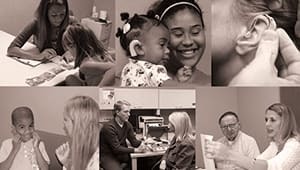 The USC Speech and Hearing Research Center, housed within the Department of Communication Sciences and Disorders, is one of only a few comprehensive speech, language, and hearing centers available to individuals in the greater Columbia metropolitan area (and, indeed, the state). The Center provides assessment and treatment services for clients from infancy to the senior years age who have a variety of communication disabilities, including disorders of speech, voice, fluency, spoken language, written language (reading and writing), hearing, etc. Your gift will have an impact on USC students and individuals throughout the greater Columbia metropolitan area (indeed, even across the state). Your financial gift will allow the Center to provide needed services to individuals within Columbia and even other parts who then can receive their needed speech, language, and hearing services. It also will help us to help clients increase their communication abilities, skills that will help them in educational, vocational, and social areas. Your gift also will allow the Center to increase the innovative speech, language, and hearing programs it offers. Covers the cost of a diagnostic session for a client in need. Covers the cost of a diagnostic session and up to three following treatment sessions. Covers the cost of innovative programs at the center.